Franchising transfers almost the entire cost of expansion to franchisees. Franchisees build the building or pay the rent, buy the inventory, pay the employees and provide the working capital until sales make the business profitable. And the growth of a franchise is limited only by the number of people willing to buy the franchise and the number of locations that can be sold. What is the cost to the franchisor? Often it is no more than it would cost to establish a single new company-owned unit. Anxious to move quickly before the competition catches on? Got a hot, new concept? Want to exploit a new marketing opportunity? 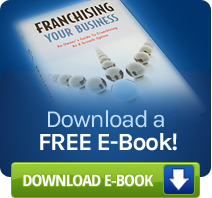 Franchising is the one growth system that allows businesses to expand exponentially. A franchise can grow fast simply by selling individual units. Some franchises can grow even faster by selling multiple units or territories to sub franchises. Either way, it is usually faster to open franchises than company-owned units. “A good manager is hard to find.” Not exactly an original idea. Studies show that franchisees make excellent managers. Why? Because they have a vested interest in the business. They own it. Through franchising, a company gets both dedicated managers and relief from the problems associated with hiring and firing personnel.